Most cities of the Latin America and the Caribbean region face similar problems, including low quality public transport supply, lack of planning, congestion, and both atmospheric and noise pollution. As a response to these growing concerns, many governments are implementing actions aimed at encouraging the use of more sustainable transport modes and reducing transport dependence on the private car. 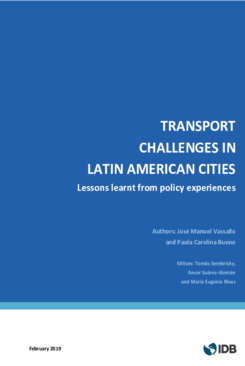 Despite the advances gained through the implementation of these and other policies in LAC, there is still a long way to go, especially in the promotion of seamless transport systems at the city level, the achievement of financial sustainability, as well as the improvement of urban air quality. This study identifies a number of best practices for overcoming or working around these challenges.